Is this really how we should present the end of WW1 and get the number of British Imperial deaths wrong? This 100 year image heads an ONS statistical note released today and they have mislaid over 400,000 British Imperial military deaths. If we are to reflect on a worldwide conflict on the 100th anniversary should we not be inclusive? I have difficulty with the ‘British’ attitude and the words used to mark a conflict that engulfed Europe, countries that were allies and countries we fought for four blood stained years in mud and gore. More than ever it is a time to stress the need to continue to work for cohesion and peace on our continent. Oh I forgot for a moment. 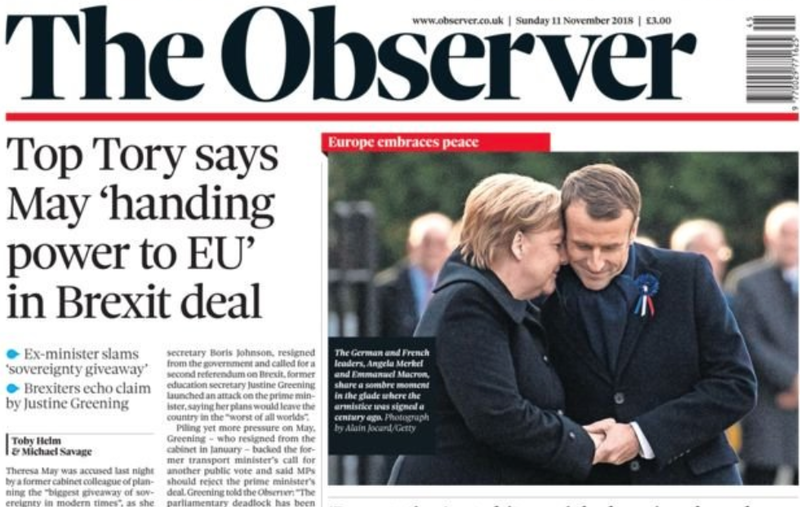 Britain is disengaging with Europe, makes silly noises about a future frictionless partnership of unknown detail or likelihood. No now is the time to remind us of Empire. Think only of the sacrifice of our own people and the sons of Empire that came to help. Agreed, the number is horrific – 700,000 deaths on battlefields of glaur where methods of engagement had changed out of all recognition to conflicts of previous centuries. 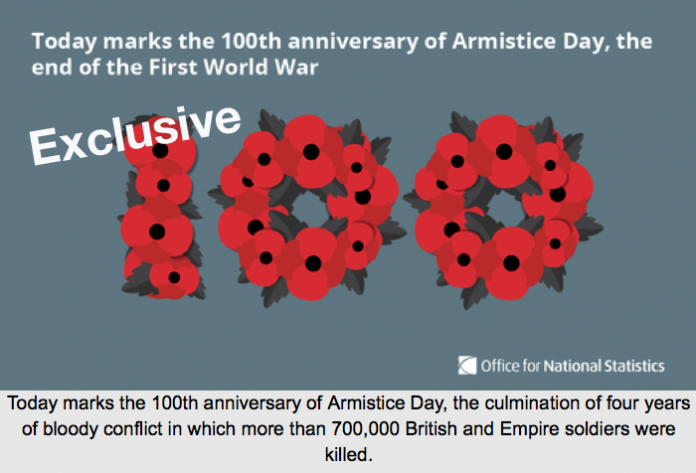 Only the number is wrong and 400,000 British Imperial military deaths have been forgotten. 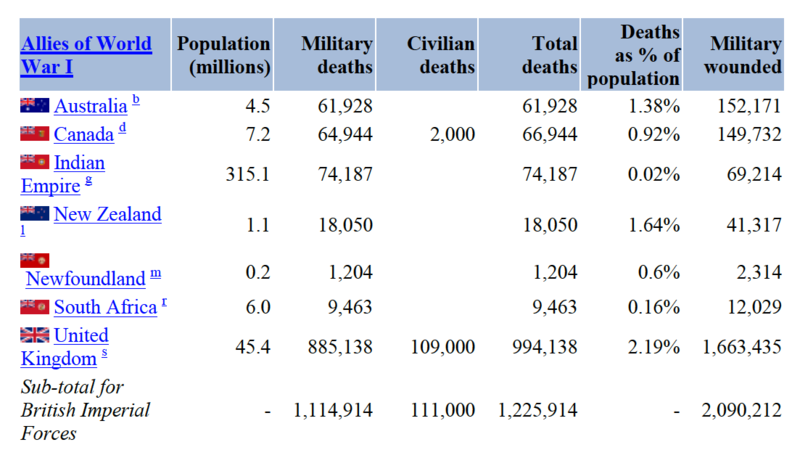 So for some context, the total number of military and civilian casualties was close to 40 million for all of Europe. That is more than the population of Britain in 1918, which then stood at 38,287,300. The total number of deaths of military personnel was 9,700,000 and 10,000,000 civilians are estimated to have died. The Entente Powers (Allies) lost around 5.7 million soldiers and the Central Powers lost about 4 million. The wounded are also usually forgotten when figures are quoted. If we are to remember them also then the impact on life and death more than doubles. 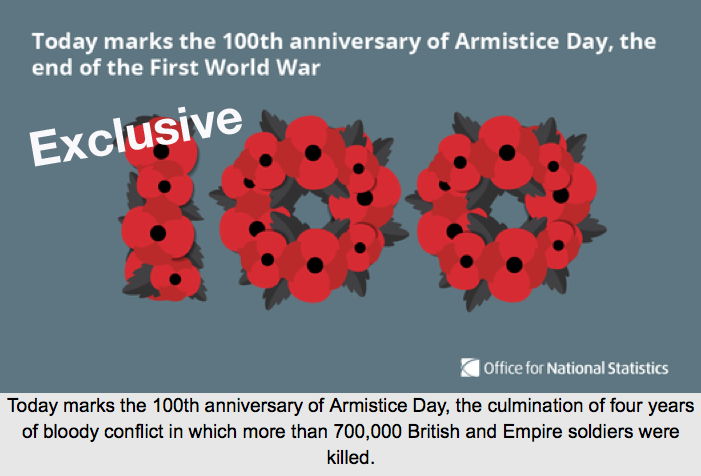 Even worse the Office of national statistics has lost close to 400,000 British Empire military deaths in the conflict. According to The Commonwealth War Graves Commission Annual Report 2007-2008 the actual number of UK military dead totalled 885,138. Add in Australia 61,928, Canada 64,944, Indian Empire 74,187, New Zealand 18,050 Newfoundland 1,204 and South Africa 9,463 and we find the sub total of all military British Imperial Forces deaths came to 1,114,914. Then we have the also forgotten military wounded at a staggering 2,090,212. If the British want to stress the impact of British Empire losses then at least they should get the figures right. If the end of this bloody conflict was to result in something positive then it was for a European future. Sadly Europe was to be again engulfed in conflict within just a few decades. Europe, despite localised conflicts and tensions, has learned to manage things better and for that reason, above many others I also value, my European citizenship means more to me than that of any one country. We will lose our European citizenship in just 140 days time. It is time for Scotland to begin to seriously plan for its own place at the heart of Europe, cooperating, taking part in decision-making, being represented in the Commission and the Parliament. If there is one image I relate to 100 years on it is the meaningful hug Macron and Merkel shared when all Europe came together to reflect on the past whilst sharing our present and future. Britain always seems to be standing alone. Next articleWhen Will the War Be By?